The Abra Police Provincial Office conducted a covenant signing for peaceful elections to engage the political candidates for the prevention of electoral violence and harassments for the midterm elections. There are 229 candidates and 23 stakeholders who participated in the said activity. 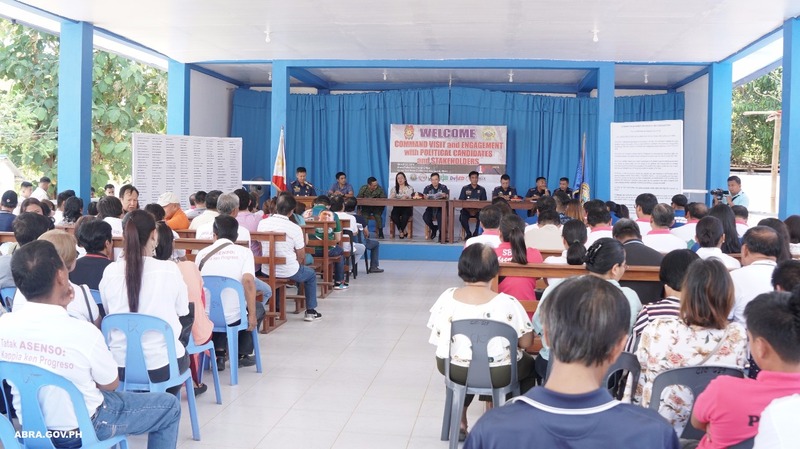 PNP-CAR Director Israel Ephraim T. Dickson, during his first command visit to Abra, emphasized the communication lines of the PNP are open to hear out concerns from the candidates and the community. Political candidates expressed their commitment to move toward a peaceful election. “Attaining a peaceful election is in our hands, my fellow candidates,” Congressman JB Bernos said during his commitment message. He encouraged the people to move forward and learn from the dark past of Abra. “Adda kadatayo nu ania ti kayat tayo a pagturungan ti probinsia tayo,” he said. Gov. Joy Valera-Bernos said she is thankful for having this kind of engagement with the candidates and stakeholders where they can make a sincere commitment for a peaceful Abra. She said the provincial government has made huge efforts to sustain peace and development in the province, promoting an awesome province, and putting Abra on the country’s tourism map. “Through these peace efforts we are hoping that Abra will no longer be an election hotspot,” she said. On the contrary, COMELEC classified Abra as an area of grave concern or category red. Dickson explained Abra was declared under category red because there is an intense political rivalry. There are private armed groups and rebel groups that may take advantage of the situation. Because of this, plus the history of political violence, Abra was declared under COMELEC control in the 2010 elections. He said it does not mean that Abra is a violent place, and being under a red category will help the police force prepare for any untoward incident during the election period. The heads of the government agencies like Provincial Director Millicent Cariño of the Department of Interior and Local Government, COMELEC Provincial Supervisor Dexter Barry Cawis, and Battalion Commander Jearie Boy Faminial of the 24th Infantry Brigade, Philippine Army also expressed their commitment for peace.